While Spotify's a powerhouse for streaming music, its social elements for sharing what you find have always been rather underpowered. Now, though, it's launched a new Discover news feed, which promises to give you a constant supply of new music. Leveraging data from its 24 million monthly users, the new Discover service—currently available on the web app, and soon to appear on mobile and desktop app versions—aims to provide new content suggestions. By evaluating a truck load of data, from what you've listened to friends you've followed, the news feed will suggest artists, playlists and songs you might enjoy. 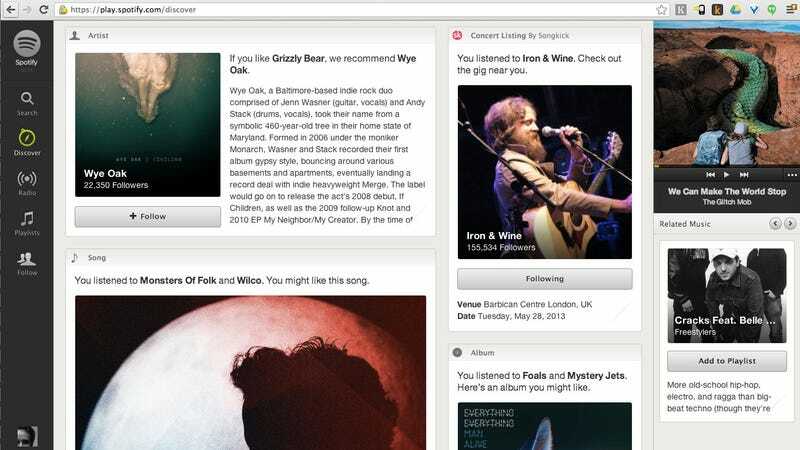 It will also bring in content from partners: concerts from Songkick, reviews from Pitchfork, that kind of thing.